Hutter comes out on top in battle of the Floridians, bests Benjamin Zamani heads up to earn $283,546 and his first gold bracelet. Tournament pro records third cash of the 2015 WSOP, complements previous 14th- and 13th-place finishes with a victory. Las Vegas (June 6, 2015) — The 2015 World Series of Poker forged on Saturday night at the Rio All-Suite Hotel and Casino in Las Vegas as Event #14 of the 68-tournament series, a $1,500 no-limit hold’em shootout bracelet event, played out in the famed Amazon Room. In the end, Barry Hutter stole the tournament’s headline becoming the series’ most-recent champion defeating fellow Floridian Benjamin Zamani heads up to earn $283,546 along with poker’s most coveted prize — a gold bracelet. The win proved to be hard-fought as the final table took the better part of 11 hours to finish and saw the likes of Grayson Ramage (ninth), Daniel Strelitz (eighth) and 2008 WSOP Main Event third-place finisher Dennis Phillips (third) each leave their mark before ultimately falling short of victory. Other notable final table participants included Elizabeth Montizanti and Kitty Kuo. Both hoped to became the first female champion of the 2015 series but ultimately finished fifth and fourth respectively. After the dust settled, Hutter’s performance stole the show as it marked his third cash of the 2015 WSOP through the first 14 events. He previously finished 14th in Event #2, a $5,000 no-limit hold’em tournament, and ran deep against an elite field in Event #10, the $10,000 heads up, before finishing 13th. 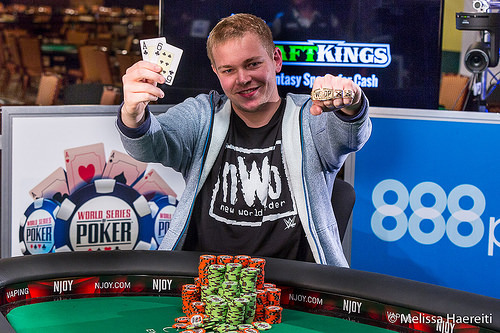 With a gold bracelet to complement those performances, Hutter’s resume at the 2015 WSOP is arguably second to none a mere two weeks into the two-month festival. Event #14 was the second of two shootouts on the 2015 WSOP schedule. With a $1,500 price point, it drew more than three times as many competitors as its $3,000 predecessor. The 1,000-player field allowed an even 100, 10-handed tables to play to a winner on Day 1, and 10, 10-handed tables to play to a winner on Day 2. Day 3 (the final table) kicked off Saturday, June 6. Never was Hutter’s play put to the test more than it was against heads-up opponent Zamani. He began the duel as the underdog holding about a third of the total chips in play. Over the course of about 50 hands, he checked and raised his way to the chip lead before ultimately turning the nut flush to send Zamani home with a $174,771 consolation prize. While the final tablists were all who returned Saturday, they weren’t the only players to head home with a score. Each of the top 100 finished in the money and all those outside the top 10 earned a score of $5,413. Among this group was three-time bracelet winner Dominik Nitsche, two-time bracelet winners Rep Porter and Mark Radoja, bracelet winner Justin Bonomo, WSOP Circuit champions Joseph McKeehan and David Tuthill as well as 2011 WSOP Main Event fourth-place finisher Matt Gianetti. 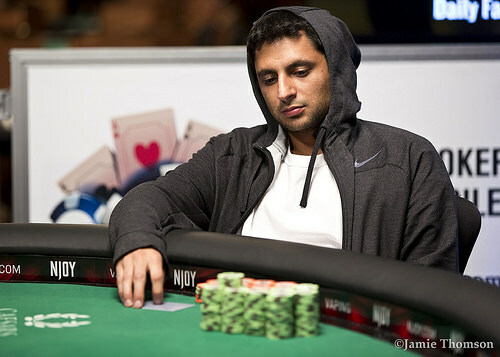 Last year’s champion, Simeon Naydenov, came up short of an in-the-money berth. 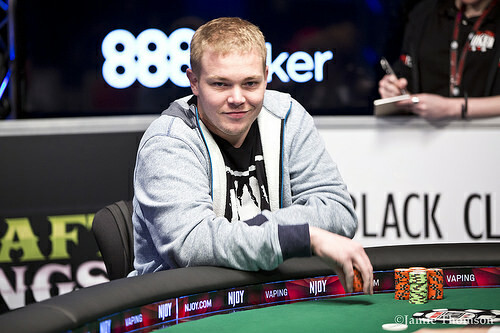 Barry Hutter's official WSOP player profile page is available HERE. Livestream archive of the event is available HERE. Barry Hutter raises to 200,000. Ben Zamani snap shoves all-in for 2,450,000. Barry Hutter thinks for a few moments and calls. The flop comes . The on the turn gives Hutter the ace-high flush and he is celebrating as the hits the river. Barry Hutter wins event #14 and the bracelet and Ben Zamani is eliminated in 2nd place. Ben Zamani raises to 280,000. Barry Hutter calls. The flop comes . Hutter checks. Zamani checks. The is the turn card. Hutter checks, Zamani bets 280,000 and takes the pot. Barry Hutter shoves all-in and Ben Zamani folds. Ben Zamani raises to 290,000. Barry Hutter folds. Barry Hutter calls on the button. Ben Zamani checks. The flop comes: . Zamani checks, Hutter bets the flop and takes it down. Ben Zamani raises to 260,000 and Barry Hutter folds. Barry Hutter raises to 200,000, Ben Zamani shoves all-in and Hutter folds. Ben Zamani calls on the button. Hutter checks. The flop comes . Hutter checks. Zamani bets 110,000. Hutter calls. The river is the . Hutter bets 190,000 and Zamani folds. Barry Hutter calls on the button. Ben Zamani raises to 335,000. Hutter folds. Barry Hutter and Ben Zamani are on break for 20 minutes. Ben Zamani raises to 160,000 and Barry Hutter calls. Hutter checks, Zamani bets 250,000 and Hutter folds. The flop comes . Zamani bets 330,000. Hutter calls. The turn is the . Zamani checks, Hutter checks. The river is the . Zamani bets 650,000. Hutter calls and shows pocket twos. Zumani folds. Barry Hutter gets a walk. Barry Hutter raises to 165,000 Ben Zamani reraises to 480,000. Hutter folds. Ben Zamani raises to 245,000 and Barry Hutter folds. Barry Hutter raises to 165,000 and Ben Zamani moves all-in for 1,625,000. Barry calls. The board runs out and Ben Zamani doubles up. Ben Zamani gets a walk.